“Architecture of Justice” gives students six credit hours using an unconventional, interdisciplinary partnership which exposes students to a wider spectrum of learning. Professors from architecture – Kristina Yu; and political science – Kathy Powers, designed the dynamic program. 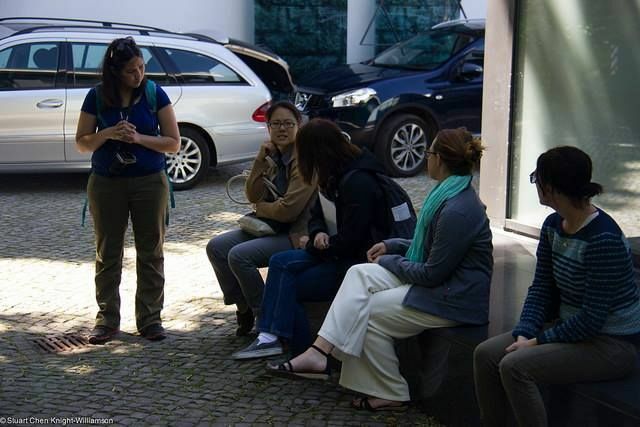 It transports students out of the classroom and immerses them in the historic city of Berlin, Germany. Their goal is to study the infrastructure of political thinking and state apologies. They also examine reparations for past injustices, made through the architectural manifestations of buildings, museums and most potently memorials. While observing German memorial sites, students evaluate events, decisions, intentions, victories and tragedies of the past. They then compare those to present and future methods of memory and reflection. Along the way, several experts also present special lectures. The professors taught the course with Albuquerque architect and adjunct faculty Cory Greenfield in 2015 and recently included Graduate Assistant Timothy Green. The four just learned they received funding for the 2017 courses from the Deustcher Akademischer Austausch Dienst, DAAD, which is comparable to the Fulbright Scholars Program. 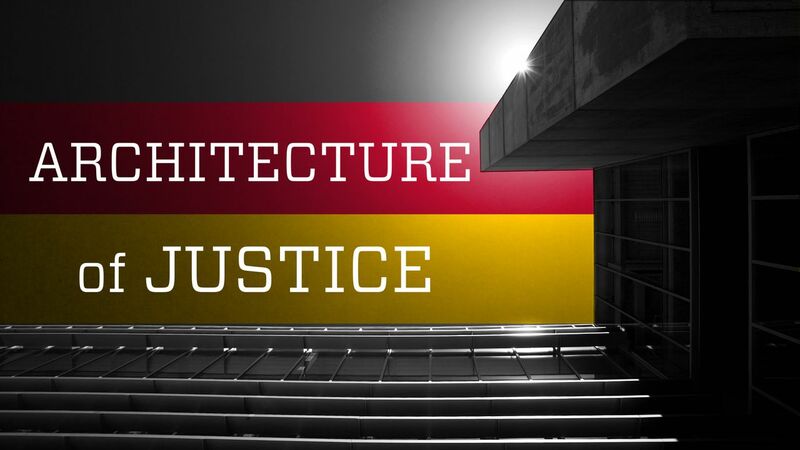 The “Architecture of Justice” courses being hosted in Germany are partially funded by the DAAD. The UNM Office of the Vice President for Research recognized the benefits of the combined courses, and funded six students to take part during the inauguratory trip in summer of 2015. Professor Kristina Yu sits for a moment with her class, discussing the places they visited that day. “The place is undeniably the nucleus of all the things we’re talking about,” Greenfield said. 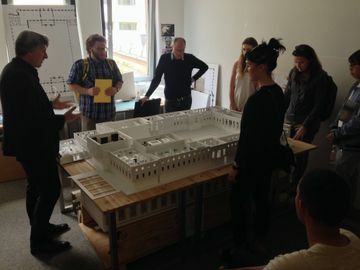 From the beginning, the faculty and students delved into various ideas, learning the history, identifying resources and exploring the why and how of Berlin’s history and its impact on them personally. During the first half of the month-long program, Powers and Green teach students about human rights, mass human rights violations and war crimes under international human rights law and international humanitarian law. In particular, they focus on the atrocities of the holocaust and the reparative justice left in its aftermath. Powers says taking students to the scene of such historic events brings them a whole new perspective. The students had time on the weekends to visit sites and places like the Holocaust Museum. The four leaders of the program says they had also support from the U.S. Holocaust Museum. 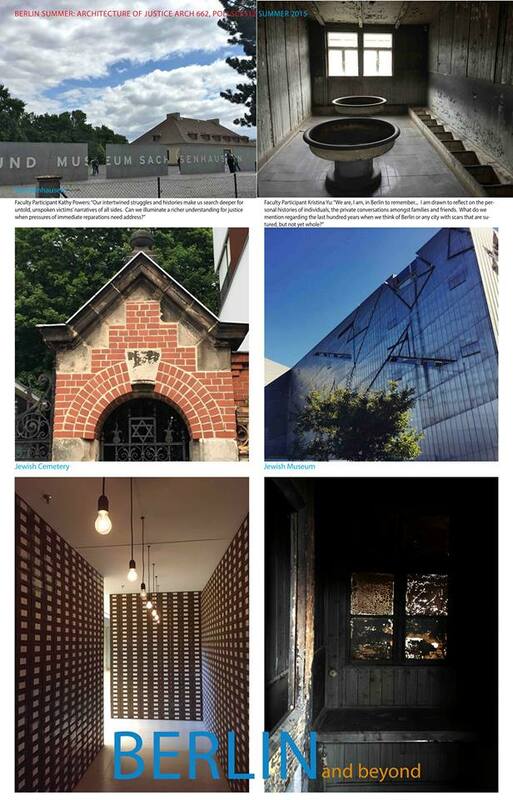 Students go on field trips to museums, buildings and memorials in Berlin, Germany. “They cannot contribute money, but they see our work as a way to keep the study alive. There are only 250,000 holocaust survivors left. What we learn can be made relevant to other atrocities,” Yu said. Powers had never taken students abroad before and was grateful for Yu’s experience and expertise. 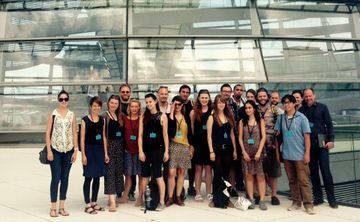 The group also reaped the benefit of a photography professor and his class being in Germany at the same time. “We discovered that we were all experiencing the same things, but the photography students represented what they experienced in a visual language,” Greenfield said, adding that those students, plus their own, remain in touch to this day. All the students who participated were impacted by the experience and are using it. One got a master’s in planning, writing about site-based atrocities and the authenticity of sites as a memorial place. Another is studying in Japan, where he explores the Japanese role of memorials. One is earning a Ph.D. in Latin American Studies, exploring the American role in the politics of contentious places. Two have been writing books, while another is off to law school to study human rights law. The professors are now getting ready to take a new group of students abroad in July; and those interested can follow their adventure on Facebook.